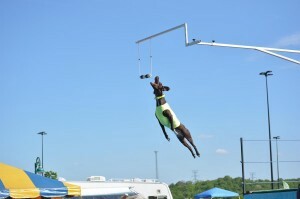 In the United States, DockDogs was established in 2000 as an athletic event in which dogs compete in jumping for distance or height from a dock into a body of water. Its first event was held at the ESPN 2000 Great Outdoor Games competition. Fifteen years later, this organization has done nothing but grow, and two of its biggest competitors live right in here in Medford. A 4-year-old German shorthaired pointer that goes by the name of Limoncello was recently invited to compete in the DockDogs World Championships in November. “We are so very excited,” Jenny Beadling said. Jenny is the wife of Brian Beadling who is “Cello’s” official handler. While Brian is technically the handler, his wife Jenny and their other GSP, Hooch, enjoy the successes they’ve experienced as a family. “Our family is just the four of us, so the time together is the best part, traveling all over and just sharing all of the laughs and experiences makes it all worthwhile,” Brian said. Cello is a bit more established than Hooch at this point in her career, as she is known within the dock diving community as pound-for-pound one of the best dogs involved in the sport. However, Hooch is certainly on the up and coming, as he is not even 1 year old. Both dogs donate all cash prizes to the GSP Rescue of New Jersey, and all food and toy prizes to The Animal Orphanage in Voorhees. They have also been chosen as ambassadors for TurboPUP, a company that specializes in meal bars for dogs. Brian and Jenny became the proud parents of Limoncello in May 2011. She received her unique name after Jenny’s grandfather’s secret recipe, so her full name is Tommy D’s Limoncello. She is the ultimate water dog. “Her entire body shivers with excitement with the site of water to jump into or lay in,” Jenny said. Luckily the Beadlings have a dock right in their backyard with a lake for the dogs to jump in at their leisure. In fact, that is where this all started. Cello placed second in the first competition she attended, and at her second competition, she took home first place. This is only her second full year competing, so the Beadlings weren’t sure how to qualify her for the world championship competition originally. This year, they were determined to get her in, so they enlisted her in all of the events that could help her qualify. These competitions consist of a series of events that test the leaping and swimming abilities of the dogs. The “big air jump” is performed on a 40-foot dock covered in AstroTurf in which one dog and one trainer run down and toss a toy in to see how far out the dog can jump. The “speed retrieve” is an event in which the dog swims to the end of a pool to grab a bumper and swims back while being timed. And the most popular of all of these events is the “extreme vert,” a contest in which a bumper is set up about eight feet over the water and is continuously raised until the last dog is left standing. The Iron Dog is a combination of all three of these, with scores averaged. This is what Cello will be competing in in Iowa for the DockDogs world championships. DockDogs has become a global corporation over the years. The multiple locations make competing in any of these events convenient for dog owners. Some of these dogs spend hours with trainers and practicing in facilities, while some folks, such as the Beadlings, do it for the enjoyment of playing with their dogs. They are often accompanied by Cello and Hooch everywhere they go. “We do everything together, dock diving, they come out with, we even bring them to wineries on occasion,” Brian said. On their most recent adventure, they took a trip to the Fairfax County Fair in Virginia where Hooch tried “extreme vert” for the first time and actually jumped higher than Cello. Hooch is actually a half brother of Cello’s that the Beadlings brought home last July. “Since we just adore Cello, and think she is just the most amazing pup, when we found out in July 2014 that Limoncello’s mother had another litter, we could not help but go visit her and see the puppies,” Jenny said. You will not have any trouble finding them online if you are interested in reading more about these exceptionally talented pups. Cello has her own website (celloscorner.com), which has attracted more than 17,240 visitors from 96 countries around the world. They also have more than 2,300 Instagram followers (instagram.com/celloscorner) and more than 800 Facebook fans (facebook.com/CellosCorner).